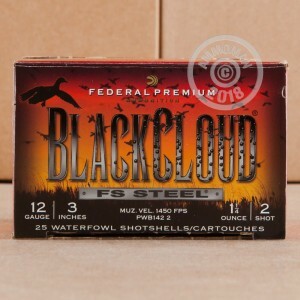 This 12 gauge variant of Federal's Black Cloud ammunition is specifically optimized for close range shots taken at 20-30 yards. Each shell packs 1-1/4 oz. of shot into a 3" hull, firing it at 1,450 feet per second. These shells use a mix of #2 steel birdshot and Flitestopper sharp-edged pellets, which add additional lethality for a cleaner kill and fewer wounded birds. 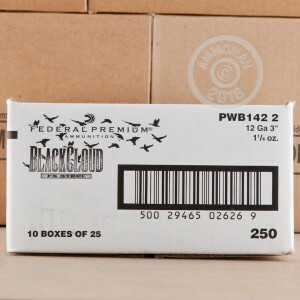 Federal waterfowl shotshells are loaded in Anoka, Minnesota and meet all requirements for using lead-free ammunition in environmentally sensitive areas. 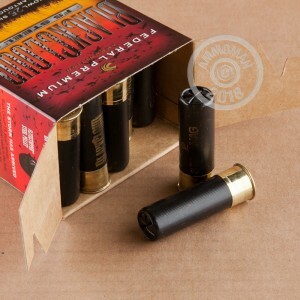 Grab a few of these 25-shell boxes or any combination of products totaling over $99 from AmmoMan.com to get free shipping!